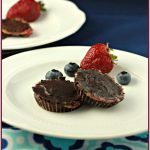 These chocolate chia berry sun butter cup are so easy and ridiculously good! For low carb, could also replace homemade jam with a low carb or a unsweetened jam. 2 tbsp sunflower seed butter , can also use any nut butter of choice. 2/3 cup chocolate chips (dairy free and soy free kind for paleo like this kind) or for low carb use 2/3 sugar free chocolate bar, chopped, like this kind or can use unsweetened bakers chocolate sweetened with low carb erythritol sweetener to taste. Skip 1 -3 steps if using sugar free store bought jam: In a small bowl combine the chia seeds and water. Stir and refrigerate for 10 minutes, or until gel like texture forms. Add the berry mixture to the chia seed and water gel. Stir together thoroughly. Melt chocolate chip in a small sauce pan on low heat. Once melted, place 2 tsp of melted chocolate at the bottom of each cup in oiled candy mold cups or small greased muffin pan. Add a 1 tsp of sunflower seed butter to the top of each chocolate cup. Then add a ½ tsp of chia berry jam layer to the top of the sunflower butter. Then top with an additional 2 tsp of melted chocolate and use spoon to spread around to cover jam. Place in freezer for 10 minutes or refrigerate for 20 minutes or more until solid. Carefully remove from mold and enjoy.